Terminator Salvation is shaping up to surely be one of the biggest hits of 2009. Hopefully the film does live up to the hype. At minimum, be better than T3! The newest trailer has released yesterday and I got it for you below along with a few new images from the trailer and LA Times. 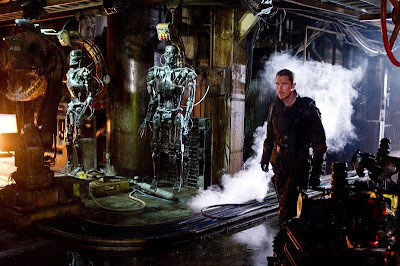 The newest trailer gives us bit more of action and alot more of the various Terminators throughout Terminator Salvation. In particular, a T-800 lying down next to John Connor on a operating table, but we also get some more looks at the T-600 and other Sky Net machines in action. McG looks to have just nailed this film, that is if you can gage the whole movie off 2 minutes and 30 seconds, but in general Terminator Slavtion looks outstanding. Checkout the production/trailer images below and the intense new trailer!